"Where can I store baggage?" 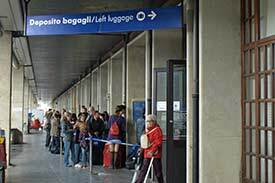 Venice's Santa Lucia Railway Station has a baggage office (deposito bagagli) near track 1. The baggage office was officially open from 6 a.m. until 11 p.m. the last time we checked, but hours can change or the attendants might decide to go out for lunch, so look at the sign on the door before you deposit your bags. The baggage office won't accept glass, and shoes or towels must be inside your bag. Queues can be long during peak season or on busy weekends. If you don't feel like waiting and you'll be back in the station area before 7 p.m., try this alternative. Where can I store baggage? Where are the toilets (WCs)? Does the station have food and shopping? Does the station have facilities for disabled travelers? How do I contact the police or the lost-and-found?